I really love this book, I think it does an outstanding job of explaining everything in a way that is not only easy to understand, but also extremely interesting. 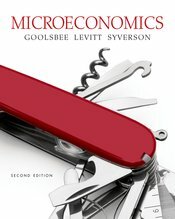 It pulls economic theory and real world examples together and makes me think about everyday events from an economic perspective. The best thing that has ever happened to me. Sometimes I sort of understand the concepts of the book but when it comes to solving the problems, it can be hard and the step-by-step methodology of the Figure it Out is great. My professor also uses them, so it’s really great to go to class. I absolutely love the Figure It Out boxes. They help so much when I am trying to study for exams or just grasp a concept that is confusing to only read about. I really like that the solution is worked out so you know the process rather than there just being an answer.